Back on 19 September 2014 I published Thomo’s Manila Hole which was a look at where Thomo’s Hole would be. Having been, as the actors say, “between engagements for the better part of the first six months of 2014, the next steps to getting Thomo’s Hole set up were held in abeyance, waiting the first full salary payment. I received the first full salary payment. So, it was off to SM Department Store (SM = San Miguel – yes, the same folks as the beer folks) and after a quick look, a suitable book/display case was located and purchased along with a computer table. The computer table will be the painting table eventually. 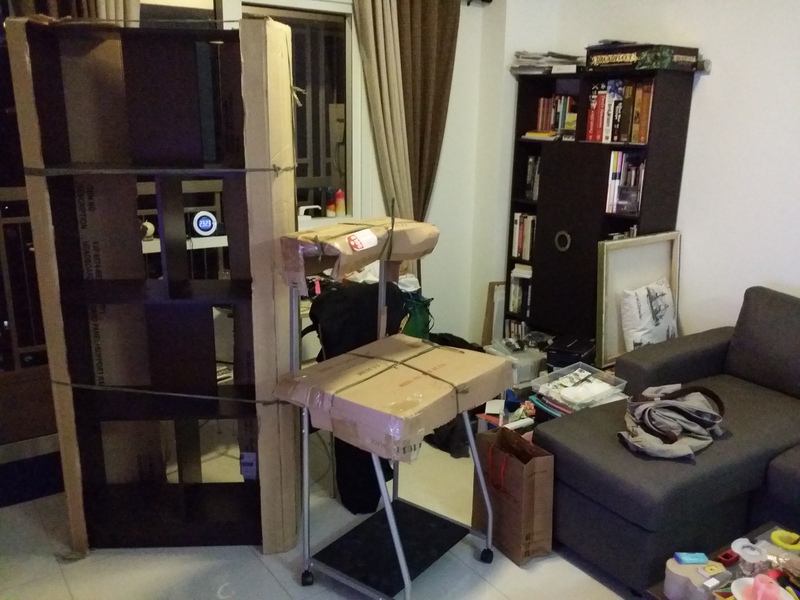 I organised for is all to be delivered on Monday – yesterday. I got home last night and nothing had been delivered so I thought “oh well, I’ll call them and yell at them tomorrow”. At around 10:30 pm however I received a phone call letting me know that the delivery was on the way. It arrived about 10 minutes later. The best thing was that apart from getting the delivery on Monday as requested, the flat pack computer table was assembled before delivery. The next photo of the Hole will be after everything has been put away! 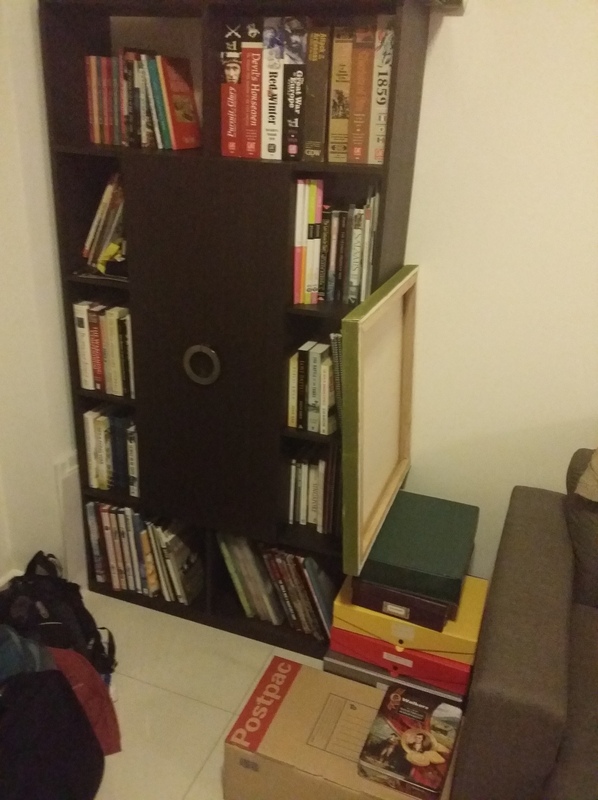 Selfish of me to ask, but yes, I would like to see pics of your painting setup and storage. So, here it is – Thomo’s Current Hole. Location is in Tanjong Pagar in Singapore. The view from the window in Thomo’s Hole takes in some ships parked in the straits – although there is a building going up there which is going to get in the way of that view. Storage for the figures (6mm, 15mm and so on) is in plastic file boxes that I get from a local stationery store here. They are about SG$5 each and stack nicely. In side I stick two sheet of adhesive thin metal sheet and make sure that the bottom of each base has a magnet there. Storage could not be simpler. Painting table is a mess and needs a tidy-up. For spray painting I purloined a couple of DHL boxes from somewhere. They are about the right size. I put a Tamiya turntable inside and on a sheet of 3mm MDF which is slightly smaller than A4, I attached another thin metal sheet. I wrap that board in glad wrap (cling wrap, saran wrap). The magnetic bases hold the figures still while spraying and the cling wrap stops the board I use on the turntable getting too many layers of paint on it. Open the box, open the window, switch on the fax fan, put mask on, put board on turntable, spin and spray and voila, job done! Storage case with some 6mm AFVs in it – the white bottom is thin metal sheet. There is even a sleeve for an Army List. The early Soviets (minus the aircraft) packed away and ready for stacking on the shelves. The view from the Hole – look closely between the buildings, you may be able to see ships. The spray chamber, bookshelf and lead pile (painted and unpainted) shelf. 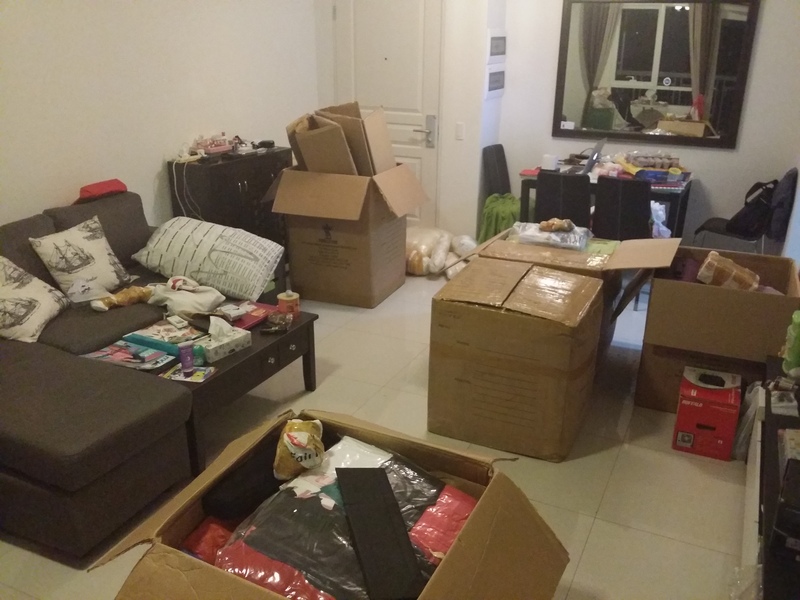 There is about 7 times as much stuff at my Mum’s house in Australia than what is shown here. As a result, the Hole will be moving. I’m not sure how many of you have tried to move a Hole before, especially when there are so many things in the Hole to move along with the Hole itself but I suspect the next few days will be interesting and in some respects, a little challenging. All should be settled again by Monday of next week. I am not certain today whether I will retain the https://thomo.coldie.net/ web address or whether I will end up with a Blogger or WordPress address. It is a matter of economics I guess. Once the move is complete I will update the various feed services that take a feed from Thomo’s Hole. A broken database table in the engine room has caused some consternation for the engineering and damage control sections of Thomo’s Hole causing an outage of around 11 hours. After a short period of head scratching and statements such as “the engines’ll not take it sir”, and “I’m an engineer Thomo, not a god ((with apologies to McCoy))” the issue has been repaired and Thomo’s Hole is back on course at cruising speed. Only 48 hours more to go until Thomo’s Hole’s dashboard returns to normal transmissions. The bulge that was the result of being reddited for the post on Korean Soldiers in WW2 German Army are slowly moving off the graph and I will soon be able to more clearly see the statistics from my regular visitors. 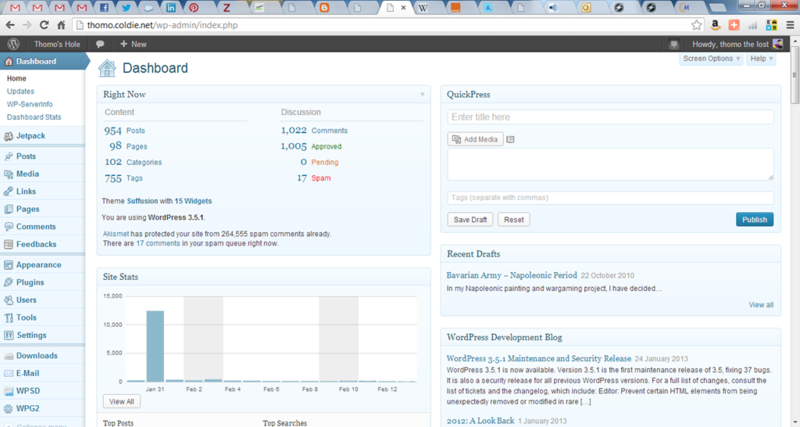 I am guessing it will be a long time before I need to worry about those sorts of numbers again – 12,425 hits in a day!